When I began posting the CBB some twenty years ago, I made a commitment to readers: “I’ll call it as I see it - and let the chips fall where they will.” Over the years, I made a further commitment to myself: Don’t be concerned with reputation – stay diligently focused on analytical integrity. I attach this odd intro to “Issues 2019” recognizing this is a year where I could look quite foolish. I believe Global Financial Crisis is the Paramount Issue 2019. Last year saw the bursting of a historic global Bubble, Crisis Dynamics commencing with the blow-up of “short vol” strategies and attendant market instabilities. Crisis Dynamics proceeded to engulf the global “Periphery” (Argentina, Turkey, EM, more generally, and China). Receiving a transitory liquidity boost courtesy of the faltering “Periphery,” speculative Bubbles at “Core” U.S. securities markets succumbed to blow-off excess. Crisis Dynamics finally engulfed a vulnerable “Core” during 2018’s tumultuous fourth quarter. As we begin a new year, rallying risk markets engender optimism. The storm has passed, it is believed. Especially with the Fed’s early winding down of rate “normalization”, there’s no reason why the great bull market can’t be resuscitated and extended. The U.S. economy remains reasonably strong, while Beijing has China’s slowdown well under control. A trade deal would reduce uncertainty, creating a positive boost for markets and economies. With markets stabilized, the EM boom can get back on track. As always, upside volatility reenergizes market bullishness. I titled Issues 2018 “Market Structure.” I fully anticipate Market Structure to remain a key Issue 2019. 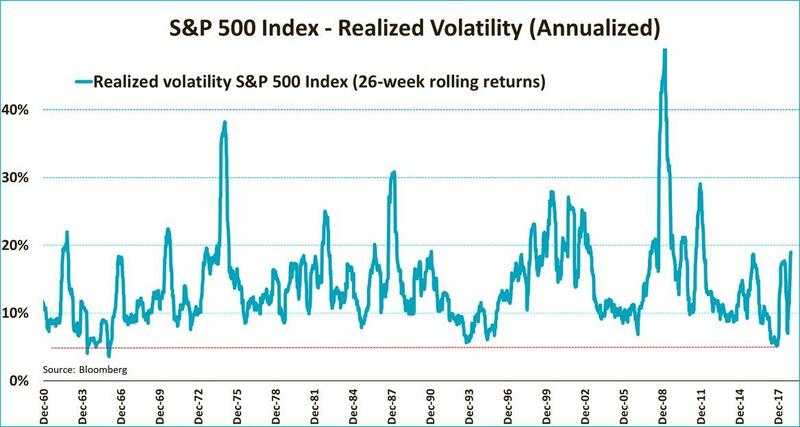 Trend-following strategies will continue to foment volatility and instability. U.S. securities markets rallied throughout the summer of 2018 in the face of a deteriorating fundamental backdrop. That rally, surely fueled by ETF flows and derivatives strategies, exacerbated fragilities. Speculative flows fueling the upside destabilization eventually reversed course - and market illiquidity soon followed. Yet short squeezes and the unwind of market hedges create the firepower for abrupt rallies and extreme shifts in market sentiment. Market Illiquidity is a key Issue 2019. Its Wildness Lies in Wait. Rallying risk markets create their own liquidity, with speculative leverage and derivative strategies in particular generating self-reinforcing liquidity. Recovering stock prices ensure bouts of optimism, along with confidence that robust markets enjoy liquidity abundance. Problem arise with market downdrafts and De-Risking/Deleveraging Dynamics. Rally-induced optimism feeds unreasonable expectations and eventual disappointment. Crisis Dynamics tend to be a process. There’s the manic phase followed by some type of shock. There’s at least a partial recovery and a return of optimism – bolstered by dovish central bankers. It’s the second major leg down when things turn more serious – for sentiment, for market dynamics and illiquidity. Disappointment turns to disenchantment and, eventually, revulsion. It’s been a long time since market participants were tested by a prolonged, grinding bear market. The February 2018 “short vol” blowup was a harbinger of trouble to come. I believe the January 3, 2019 “flash crash” portends serious Issues 2019 in global currency markets. An 8% intraday move in the yen vs. Australian dollar exposed problematic liquidity dynamics. Last year, the “short vol” market signal was initially dismissed then soon forgotten. The recent currency market “flash crash” is an ominous development of potentially momentous significance. Our so-called “king dollar” is indicating some vulnerability to begin the new year. Newfound Fed dovishness has caught many traders too long the U.S. currency and short the yen, Canadian dollar, renminbi and EM currencies more generally. A clash among a band of fundamentally weak currencies is a critical Issue 2019. When the current currency market short squeeze runs its course, I see a marketplace that’s lost its bearings. A new global currency regime of extraordinary uncertainty, instability and volatility is an Issue 2019. This unsettled new regime is not conducive to speculative leverage. The U.S. dollar has serious fundamental issues: Trillion-dollar fiscal deficits; large structural Current Account Deficits; huge government, corporate and household debt loads; fragile securities markets; a maladjusted Bubble Economy; political dysfunction and, potentially, Washington chaos; and festering geopolitical risks. The world’s reserve currency is fundamentally unsound. The dollar is also the nucleus for a financial apparatus financing much of the world’s levered speculative holdings. De-risking/Deleveraging Dynamics in 2018 saw waning liquidity and widening funding and hedging costs in the entangled world of dollar funding markets. With the likes of Goldman Sachs and Deutsche Bank seeing CDS prices rise significantly late in 2018, mounting systemic fragility would appear a serious Issue 2019. China’s currency has serious fundamental issues: A vulnerable banking system approaching $40 TN of assets (more than quadrupling since the crisis), with Trillions of potentially suspect loans; a troubled “shadow” banking apparatus; an historic housing Bubble with an estimated 65 million vacant units; a deeply maladjusted economic structure; Bubble economic and financial structures dependent upon ongoing loose financial conditions and rapid Credit expansion; huge financial and economic exposures to the emerging markets and the global economy more generally; a population with significantly elevated expectations prone to disappointment and dissatisfaction; and mounting geopolitical risks. In short, China’s historic Bubble is increasingly susceptible to a disorderly collapse. Hong Kong’s Hang Seng China H-Financial Index dropped 18% in 2018, although China’s banks outperformed the 28% fall in Japan’s TOPIX Bank Index. I would tend to see Asia finance as especially vulnerable to the unfolding global Bubble collapse. Waning confidence in the region’s financial stability would portend acute currency market instability. China’s currency is especially vulnerable to capital flight and the imposition of draconian capital controls. The big unknown is how much “hot money” and leverage has accumulated in Chinese markets. The Indonesia rupiah remains vulnerable to tightening global finance. I worry about India’s banking system after years of Bubble excess. I have concerns for the region’s financial institutions generally. The stability of the perceived stable Hong Kong and Singapore dollars is on the list of Issues 2019. Fragile Asian finance has company. Italian banks sank 30% in 2018, slightly outperforming the 28% drop in European bank shares (STOXX 600). Italy’s 10-year yields traded to 3.72% in late-November, before ending the year at 2.74% (up 73bps in ’18). Italian – hence European – stability is an Issue 2019. I believe a problematic crisis is likely to unfold in 2019, perhaps sparked by dislocation in Italian debt markets and the resulting crisis of confidence in Italy’s fragile banking system. Serious de-risking/deleveraging in Italian debt would surely see contagion in the vulnerable European periphery – including Greece, Spain and Portugal. Italy’s Target2 balances (liabilities to other eurozone central banks) almost reached $500 billion in 2018. 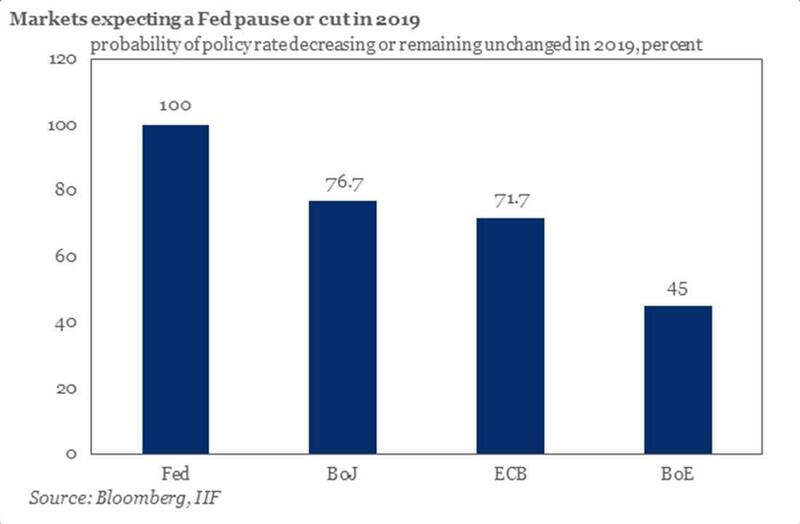 Heightened social and political instability would appear a major Issue 2019, not coincidental with the end of ECB liquidity operations. Draghi kicked the can down the road. Markets, economies, politicians and protestors have about reached the can. A crisis of confidence in Europe would ensure problematic currency market instability. Such a scenario would portent difficulties for vulnerable “developing” Eastern European markets and economies. Many economies would appear vulnerable to being locked out of global financing markets. A full-fledged financial crisis engulfing Turkey cannot be ruled out. Last year saw significant currency weakness also in the Russian ruble, Iceland krona, Hungarian forint and Polish zloty. I would see 2018 difficulties as a harbinger of much greater challenges ahead. Bubbles are mechanism of wealth redistribution and destruction. This reality has been at the foundation of my ongoing deep worries for the consequences of history’s greatest global Bubble. We’ve witnessed the social angst, a deeply divided country and waning confidence in U.S. institutions following the collapse of the mortgage finance Bubble. I fear that the Bubble over the past decade has greatly increased the likelihood of geopolitical tensions and conflict. Aspects of this risk began to manifest in 2018, as fissures developed in the global Bubble. Geopolitical conflict is a critical Issue 2019. Trade relations are clearly front and center. Going forward, I don’t believe we can disregard escalating risks of military confrontation. Bubbles inflate many things, including expectations. I worry that the protracted Chinese Bubble has so inflated expectations throughout China’s large population. With serious cracks in their Bubble, Beijing will continue to craft a strategy of casting blame on the U.S. (and the “west”). The administration’s hard line creates a convenient narrative: Trump and the U.S. are trying to hold back China’s advancement and ascendency to global superpower status. A faltering Bubble and deteriorating situation in China present Chinese leadership a not inconvenient time to confront the hostile U.S. The South China Sea and Taiwan could loom large as surprise flashpoint Issues 2019. There are a number of potential geopolitical flashpoints. Without delving into detail, I would say generally that geopolitical risks will continue to rise rapidly in the post-Bubble backdrop. Issues easily disregarded during the Bubble expansion (i.e. the Middle East, Russia, Ukraine, Iran, etc.) may in total become more pressing Issues 2019. I can see a scenario where the U.S. is spending significantly more on national defense in the not too distant future. “Chairman Powell ‘very worried’ about massive debt” was an early-2019 headline. 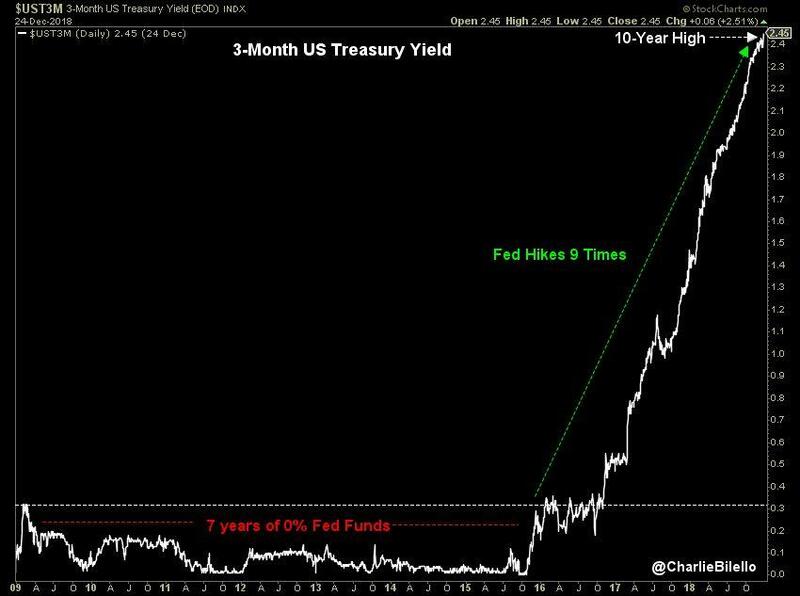 I believe the U.S. Treasury market in 2018 hinted at a momentous change in Market Dynamics. 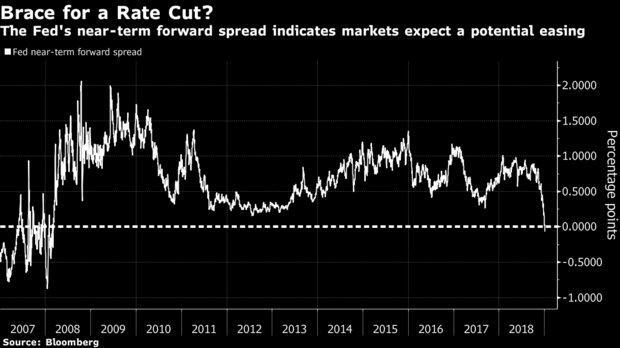 And while a bout of “risk off” and a powerful short squeeze fueled a big year-end rally, there were times when Treasuries’ traditional safe haven appeal seemed to have lost some luster. The unfolding bursting Bubble predicament turns even more problematic if ever Treasury yields rise concurrently with faltering risk markets. Such a scenario seemed more realistic in 2018. With huge and expanding deficits as far as the eye can see, the suspect dollar and mounting geopolitical tensions, the potential for a disorderly rise in Treasury yields is a potential surprise Issue 2019. Whether Treasury yields surprise on the upside or fall further in an unfolding crisis backdrop, U.S. corporate Credit is a pressing Issue 2019. Thursday (Jan. 10) ended a 40-day drought in junk bond issuance (longest stretch since at least 1995). Both high-yield and investment-grade funds suffered major redemptions in late-2018, exposing how abruptly financial conditions can tighten throughout corporate finance. Fueling liquidity abundance throughout the boom, ETF flows were exposed as a critical market risk. Flows for years been dominated by trend-following and performance-chasing strategies on the upside. The reversal of bullish speculative flows was joined in late-2018 by speculative shorting and hedging-related selling. Liquidity abundance abruptly transformed into unmanageable selling pressure and acute illiquidity. Pernicious Market Structure was exposed and, outside of short squeezes and fleeting bouts of optimism, I believe putting the ETF humpty dumpty back together again will prove difficult. The misperception of ETF “moneyness” is being cracked wide open. Enormous leverage has accumulated throughout corporate Credit over the past decade. This portends negative surprises and challenges in the unfolding backdrop. At this point, I’ll assume some type of trade agreement is cobbled together with the Chinese. This might provide near-term support for the markets and global economy. But I don’t believe a trade agreement would fundamentally change the backdrop of faltering global financial and economic Bubbles. Expect ongoing global pressure on leveraged speculation. As an industry, the hedge funds did not experience huge redemptions in 2018. I expect redemptions and fund closures to be a significant issue following the next bout of serious de-risking/deleveraging. A similar dynamic could be expected for the ETF complex. Late-2018 outflows were likely just a warmup for the type of destabilizing flows possible in a panic environment. The possibility of a 1987-style “portfolio insurance” debacle except on a grander – global, multi-asset class - scale is an Issue 2019. The U.S. economy has vulnerabilities. Yet Unsound Finance is a predominant Issue 2019. 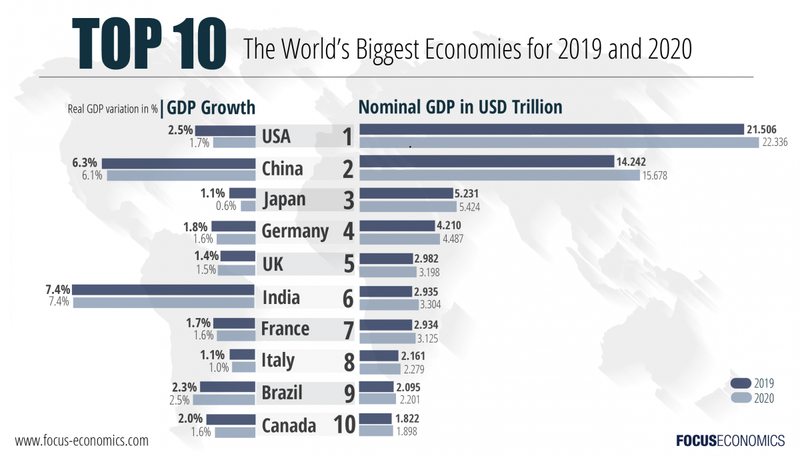 Outside of possible dreadful geopolitical developments, I would argue that the key major risk for 2019 is the seizing up of global markets. Unprecedented amounts of risks have accumulated across markets around the globe. Consider a particularly problematic scenario: a major de-risking/deleveraging episode sparks upheaval and illiquidity across currencies, equities and fixed-income markets. Such a scenario might incite a crisis of confidence in major global financial institutions, including derivatives markets and counterparties. Central bankers better not disappoint. Last week’s dovish turn by Chairman Powell broke the bearish spell and reversed markets higher, though this came weeks late in the eyes of most market participants. “We know that long periods of suppressed volatility can lead to the build-up of risks and to a disruptive ending, and the idea that monetary policy can ignore that and leave it to macroprudential tools just is not credible to me.” This prescient comment (released Friday) is extracted from 2013 Federal Reserve transcripts. Governor Powell at the time clearly had a firmer grasp of the risks associated with QE than chairman Bernanke and future chair Yellen. It is my long-held view that the Fed (and the other major central banks) will see no alternative than to resort to QE when global markets “seize up.” Ten-year Treasury yields at 2.70%, German bund yields at 22 bps and JGBs at zero don’t seem inconsistent with this view. It’s been a decade (or three) of Monetary Disorder. Now come the consequences, commencing with acute market and price instability. I believe this instability will end in a serious and prolonged crisis. There will be policy interventions, of course. But it will become increasingly clear that flawed monetary doctrine and policies are more the problem than the solution. In an increasingly acrimonious world, how closely will policymakers coordinate crisis responses? Will central bankers stick with “whatever it takes”? How quickly will they react to the markets – and with how much firepower? Uncertainty associated with monetary policymaking in a global crisis environment is an Issue 2019. - This series of articles is looking at the world's four largest economies, touching upon the current negatives (many) and positives (less). - It's important to remember that the state of the economy and the behavior of the market aren't necessarily walking hand-in-hand. - Like anything else in life, there are also pros and cons in the US economy, and this is not a black-or-white type of article. - Having said that, it certainly seems/feels like there are more from the latter. By now, it's clear that the world's economy is cooling off. Almost everywhere one looks at - there are more and more signs of weakness. In this series, we will touch upon each of the world's four largest economies, trying to figure out how bad (or good) things are. Part I, the one you're currently reading, focuses on the US (SPY, DIA, QQQ, IWM), the world's largest economy. Part II will focus on China (MCHI, FXI), the world's second largest economy. Part III will focus on Japan (EWJ, DXJ), the world's third largest economy. Part IV will focus on Germany (EWG), the world's fourth largest economy. By the way, the ranking isn't expected to change over the next few years. Only a few weeks post the market entering a bear market territory. While a bear market doesn't automatically/necessarily lead to a recession - this isn't something that should be easily dismissed. Still seeing parts of the yield curve inverting, especially the up tenors up to five years. Once again, although a full inverted yield (usually measured by the 2s10s spread) is neither certain nor guaranteeing a recession - a 10-2 inversion is a very reliable indicator and, if and when we get there, investors should be very mindful of it. Keep getting mostly negative/"broken" economic data. As this article suggests, there are many areas within the world's economy (generally speaking) and the US (specifically) that need to be addressed. In this article, we will touch upon all the recent red signals, but we will also present some points/areas that provide reasons to remain optimistic, or at least not totally pessimistic. From a more aggressive approach to being more defensive. Less growth (e.g. technology), more income (e.g. REITs). 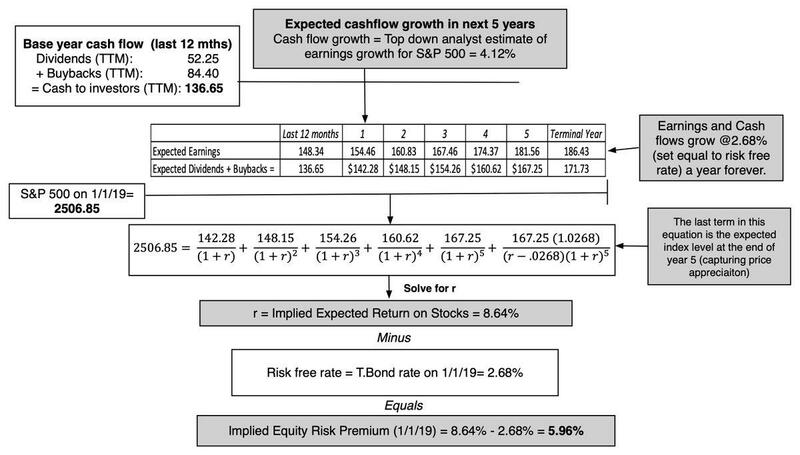 Reducing risk and HY, adding safety and IG. Dumping long-duration, focus on short-to-medium duration and relatively shorter tenors/intervals. Increasing the floating-rate exposure at the expense of fixed-rate. Employing more hedges by using pair trades, option-trading, and short selling. Such a shift, although it provides no protection against a market correction, has put us in a much better position to withstand the -20% drop stocks went through over a short period of time. We strongly suggest for readers to keep their eyes wide-open and adhere to the most important thing when it comes to investing: Risk management. Risk management isn't a recipe to avoid losses, but it's an ongoing process of asking yourself many "what IFs" type of questions. For example: What if there's no trade deal agreement? Are you ready for this? The most important virtues any investor should strive for are: Patience, Discipline, Consistency, and Flexibility, or (as we like to call this) P-DCF. As most of you probably know, DCF also stands for "Distributable Cash Flow". If we decide that the "P" stands for "Proven", we can say that adopting the P-DCF virtues may lead to a better, certainly safer, and Proven Distributable Cash Flow. 1. 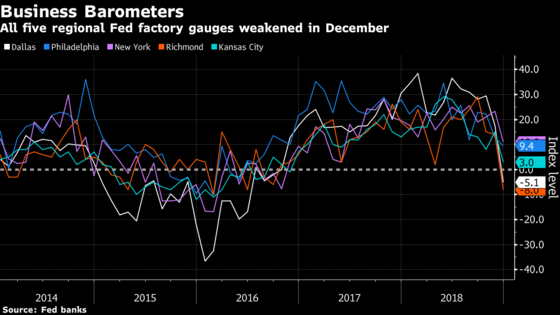 Five Fed indices of regional manufacturing all slumped together in December, the first time they've fallen in unison since May 2016. 2. A market indicator closely watched by the Fed as one of the most accurate gauges of economic health is pricing in lower rates for the first time in more than a decade. 3. Some may view this as a sign of (recent-past) growth, but it's hard to argue that this is not a cause for a (future) weakness. It certainly seems like the Fed is going to pause, or at least be very cautious with future hikes. Once again, hard to argue this isn't a result of a weakness, not strength. 4. 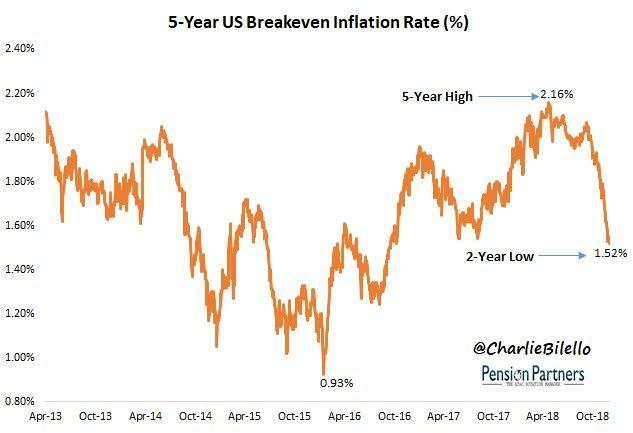 Inflation expectations (5-yr break-even) are now at a 2-year low: 1.52%. Safe to say that the Fed will be on hold for a while. 5. US Home Prices continue to hit new highs, but rate of change is slowing. Prices are up 5.5% in the past year, lowest growth rate since December 2016. 6. 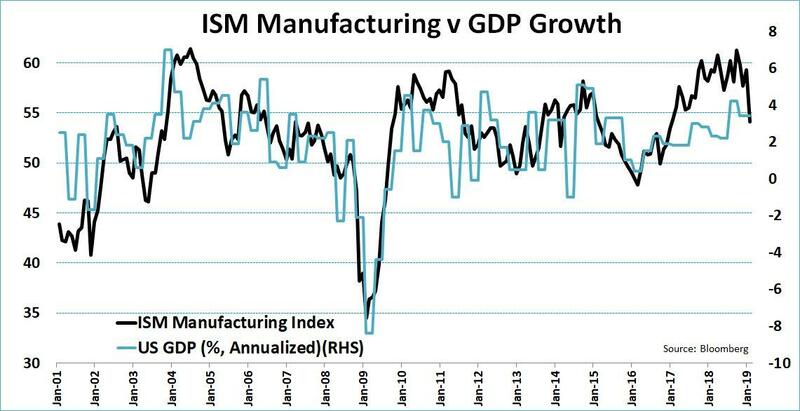 The ISM Manufacturing Index posts its biggest one-month drop since 2018! 7. In one word: Debt. The US national debt is closing fast on $22 trillion. On one hand, you may wish to claim that higher debt assists higher growth. 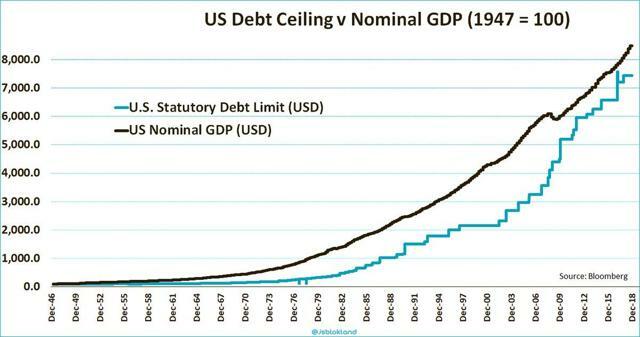 On the other hand, when debt rises at a much faster pace than growth itself - it's clear that something is broken. 8. A war the US is unlikely to win. 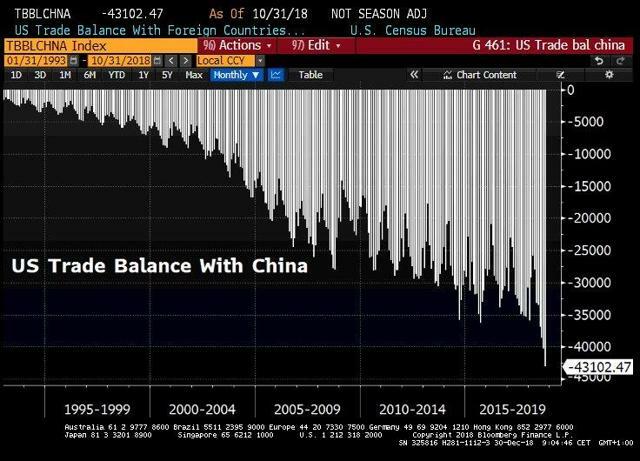 Trump says "big progress" on possible China trade deal as US trade deficit with China hits fresh high. It's not supposed to be, but out of 15 major asset classes, only one finished higher in 2018, and you already know who. 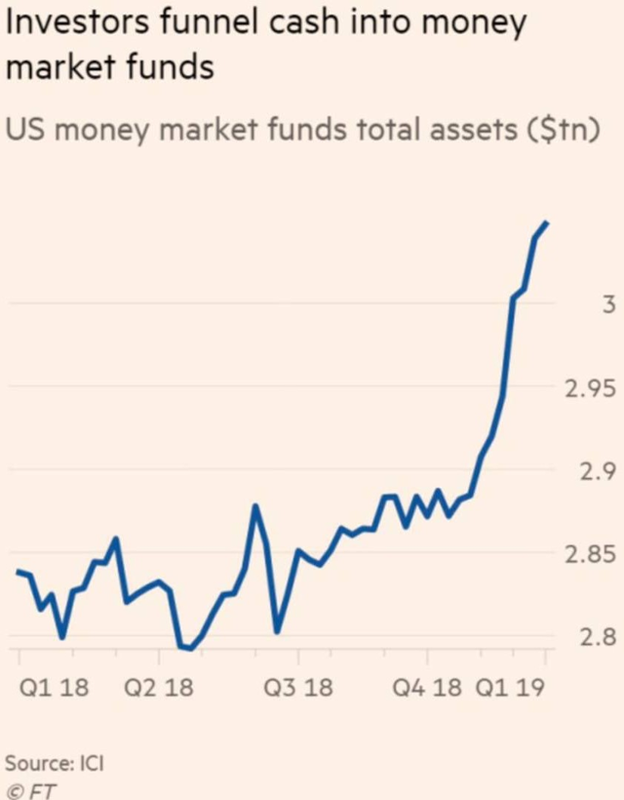 US money market funds have seen $175 billion of inflows over nine straight weeks, the longest such streak since October 2008. 10. The whistle-blowing sector. US Financials (XLF) are down 25% from their January high. During the 2015-16 correction, they lost 23%. During the 2011 correction, they lost 34%. 1. Trade boom/End of trade war seems near. What would it take to re-balance US-China trade? 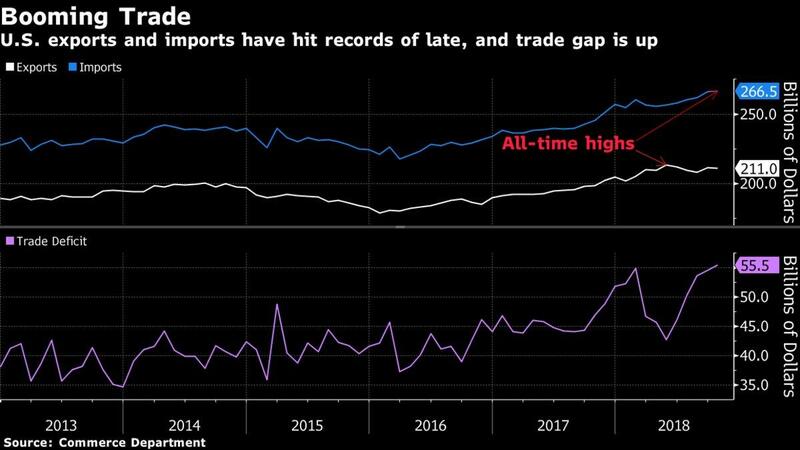 I still think it requires FX realignment (somewhat like the Plaza Accord) — which could be achieved by simply cutting and pasting the USMCA's FX chapter into a G-2 trade agreement. 2. Monetary policy is likely to shift. It's no surprise then to see Robert Kaplan, President of the Federal Reserve Bank of Dallas, saying the US central bank should put interest rates on hold until uncertainty clears. 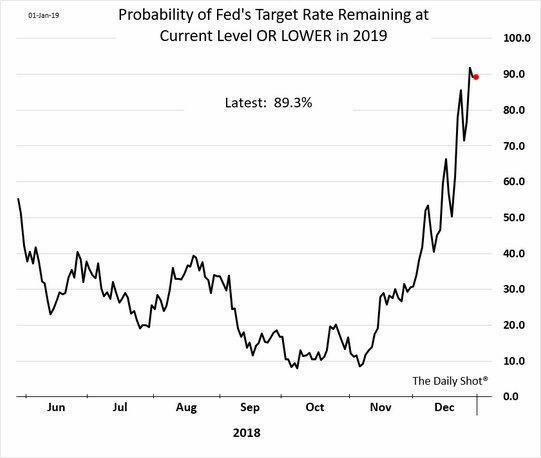 As a result of tighter financial conditions, lower inflation expectations, and soft economic data, markets are now pricing in an 89% probability that the Fed will not hike rates this year (and may even lower them). Trading 60 bps off its high water-mark (less than 2 months ago), the US 2-year yield is implying that the Fed is done. 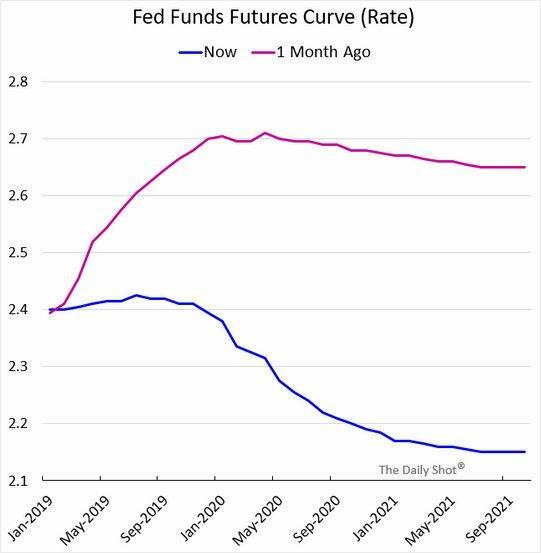 At 2.37%, below the Fed Funds future rate, the market is expecting a rate cut within the next two years. 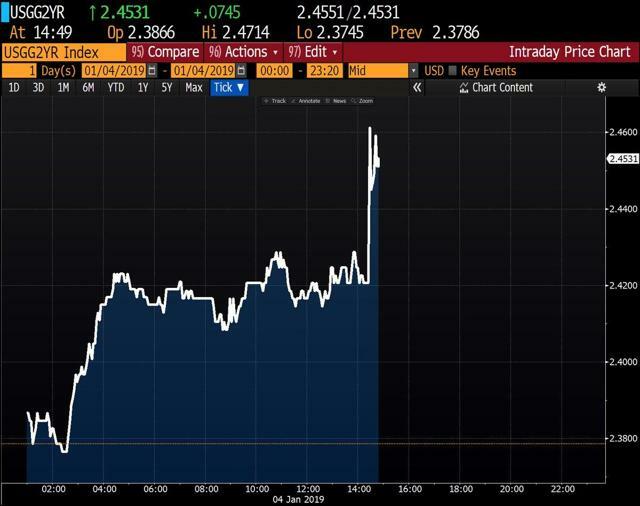 As a matter of fact, traders are now fully pricing in a Fed rate cut by April 2020. The US stock market is pointing to a massive reduction in GDP growth, the ISM Manufacturing Index is not. But which one is right? 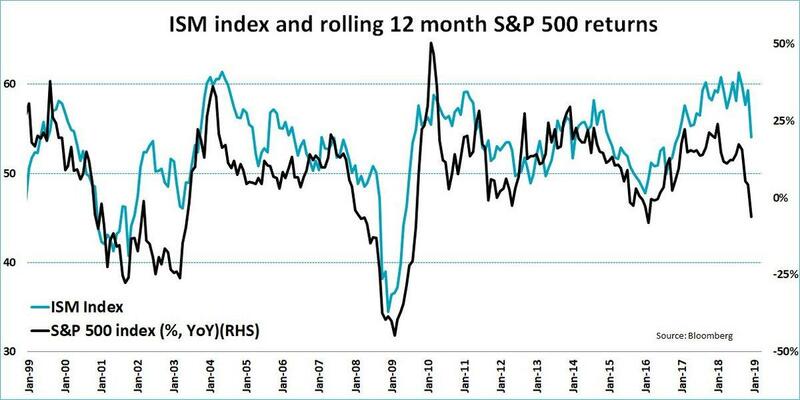 Stocks are already pricing in a severe downturn in manufacturing input. Unless we have another big crisis, stocks may offer an interesting entry point here. 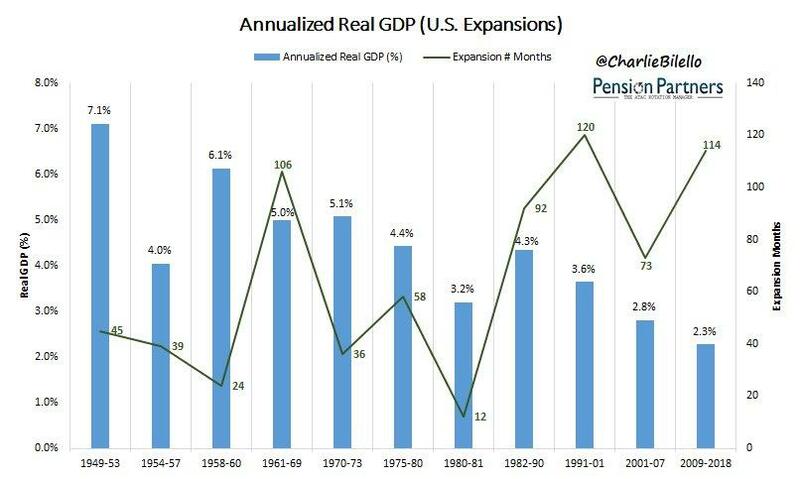 Let's not also forget that the US economic expansion is now 114 months old. If it lasts for another just 7 months, it will set a new record, breaking the prior run from 1991-2001. 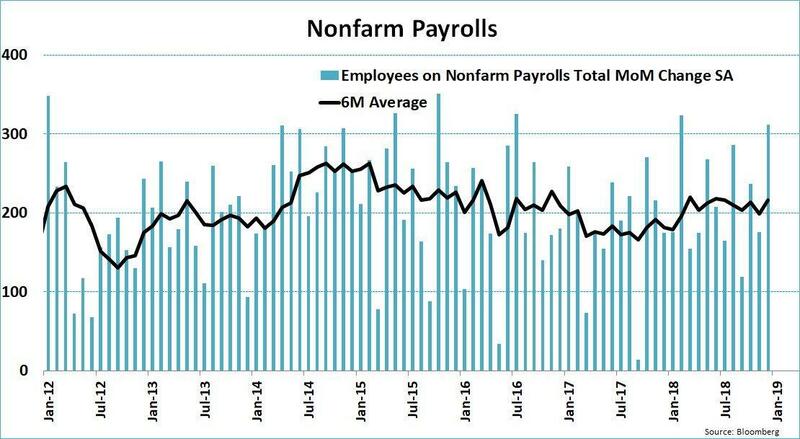 Non-farm payrolls increased a massive 312K in December, almost doubling the expected rise (Yet, unemployment rate rises to 3.9%). US wages rose 3.2% Y/Y in December, more than expected and the fastest pace since April 2009! increasing unemployment rate is reducing (or at least keeping potential) inflationary pressures in check. I don't know about you but to me - the above doesn't sound that recessionary. The 2-year Treasury yield has jumped as jobs and wages beat expectations. This could, not (necessarily) should, keep the Fed from pausing. After all, strong economic data, leading to higher yields, is calling for a hawkish (not dovish) Fed. At the same time, the higher unemployment rate indicates more slack in the labor market, with less inflationary pressures. However, it's important to bear in mind that we are not yet out of the woods. 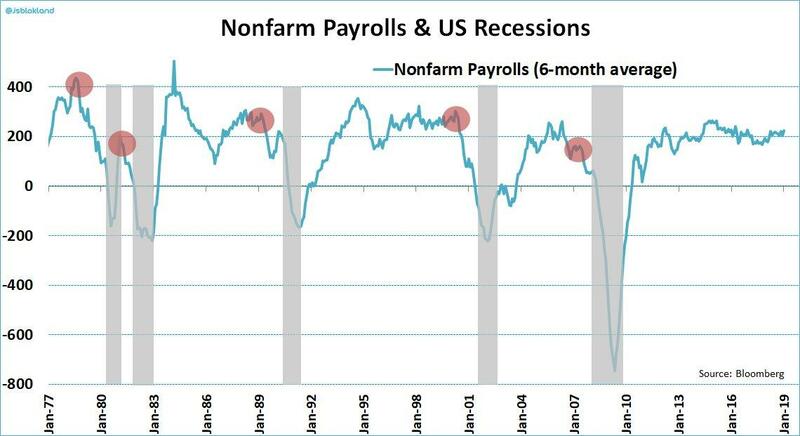 Non-farm payrolls do tend to peak at least 12 months before a recession occurs. 5. Been there, done that. Nothing to get (overly) excited about. Volatility (VXX) may seem like it's going crazy, but truth is, it feels more extreme than it actually is. So don't listen to anyone who says what you're seeing today in markets is "crazy" or "abnormal." 2017 was the abnormal outlier. This is standard behavior, the price of admission for long-term investors. After a battering in the fourth quarter of 2018, are stocks ready to rebound? The ERP, at 5.96% at the start of 2019, is a good sign, but slowing economic growth and market crises are ever present dangers. I'd argue that the Fed is having a bigger effect on markets today than the blowout jobs report. Last Friday, Fed Chair Powell (with the kind assistance of his predecessors) bolstered the idea that the US economy looks good, but isn't at risk of overheating, so there's no need to be hasty with rate hikes. 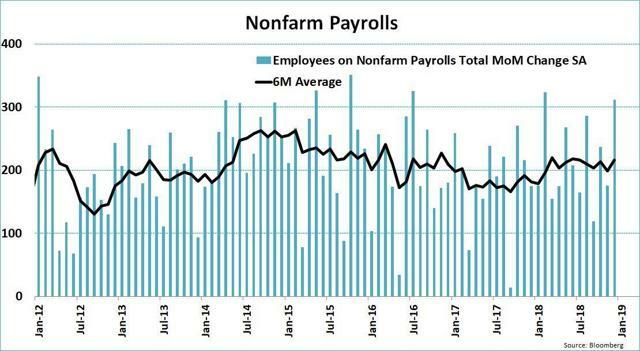 The employment situation report last Friday saw a big beat in the number of new jobs versus the market consensus and vast majority of expectations. Wages gain at a pace that matches the fastest since 2009. This makes the Fed's job difficult and is leading to a flatter yield curve, with investors seeing perhaps marginally more rate hikes and lower long-term growth. 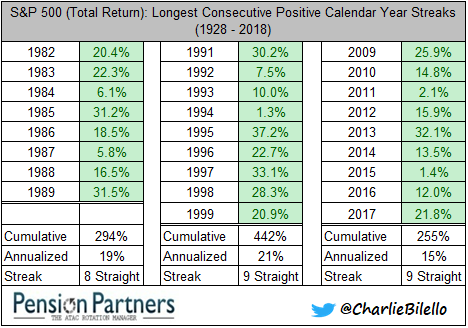 The record bull run from 2009-2017 ended in a tie, with the 1991-1999 bull run as the longest positive streak of positive years in history. Nonetheless, the 1991-1999 run had returned 442% versus "only" 255% that the 2009-2017 run gained. Even the shorter ("only" 8 years) bull run of 1982-1989 had returned more than the most recent run. There's always something to aspire for and records are made to be broken. China has approved new rail projects worth more than $125bn in the past month as it steps up fiscal spending to counteract a slowdown in its economy, a move that could give Beijing more breathing space in its trade confrontation with Washington. The National Development and Reform Commission, China’s top planning agency, has approved urban rail projects in eight cities and regions worth a total of Rmb860bn ($125bn) since December 5, according to official statements. The investment drive comes as Washington and Beijing on Monday began their first face-to-face talks since presidents Donald Trump and Xi Jinping agreed a trade truce at the G20 Summit in Buenos Aires late last year. It also highlights Beijing’s fears about slowing growth, with official data last week showing the first monthly contraction in manufacturing activity since 2016, and China’s central bank issuing its largest cut to bank reserve requirements in over a year. China will add 6,800km of rail lines this year, a 40 per cent increase from the amount added last year, said the state-run China Railway Corp. The plans include 3,200km of high-speed rail. The surge in project approvals is in dramatic contrast with the beginning of 2018, when Beijing abruptly cancelled subway lines in several cities to slow the growth of local government debt. Beijing has signalled an easing of its deleveraging drive in recent months, after investment growth in fixed assets fell to the lowest rate on record, and retail spending growth slowed to its slowest pace in 15 years. Cheng Shi, chief economist at the international division of Chinese bank ICBC, wrote in a note this month that he expected four separate cuts to bank reserve requirements this year, the same number as in 2018. “In 2019, fiscal policy will replace monetary policy to become the main tool to manage short-term demand,” he said. ING predicts Beijing will unleash a Rmb4tn fiscal stimulus this year, which will help cushion downward pressure on demand from the trade war with Washington. “Though some fiscal money will be used for debt repayment and loan rollovers, the rest will go into infrastructure projects, which will support manufacturing activities, even if the trade war continues to escalate,” said Iris Pang, the Dutch bank’s chief China economist. Among the projects approved, Shanghai will add six subway lines and three inter-city rail lines priced at Rmb298bn, while the city of Wuhan in central China will add four subway lines and four inter-city lines costing Rmb147bn. Jiangsu province in east China will build Rmb218bn of inter-city lines as it seeks to connect its urban centres with populations above 200,000. Half of the spending will be funded by tax revenue and equity financing, the NDRC said, with the remainder coming from bank loans and other debt. China has in the past decade constructed some of the world’s most advanced infrastructure — including the longest high speed rail network of any country, covering more than 25,000km — meaning future projects will face diminishing returns. While China accounted for 30 per cent of global city rail at the end of last year by track length, it accounted for only a quarter of ridership, a sign that some lines were underused, according to the International Association of Public Transport. If a foolish consistency is the hobgoblin of little minds, as Emerson famously wrote, the Federal Reserve under Jerome Powell has proved itself to be eminently broad-minded. Already in this new year, the Fed chairman has emphasized the central bank’s willingness to be patient in raising interest rates while indicating some flexibility on the pace of reduction of its balance sheet. That represented a reversal from expectations that there would be two rate increases of one-quarter percent in 2019 and that the reduction of the central bank’s assets was to proceed on autopilot. The alleged Fed flip-flop appeared to stem from the vicious late-2018 selloff in risk assets, notably in the stock market. After the new year got off on the wrong foot, with a 660-point plunge in the Dow Jones Industrial Average on Jan. 3, Powell changed his tune in an appearance on Jan. 4 with his two immediate predecessors, Janet Yellen and Ben Bernanke. The market value of U.S. stocks jumped by about $1.1 trillion in the first six trading sessions of 2019, or some 3.85%, according to Wilshire Associates, which topped the previous record early-year spurt of $1 trillion gained in the first eight sessions of 2018. Good news, right? Not to some critics who accused the Fed, and Powell in particular, of kowtowing to the equity markets. “James Carville’s endlessly repeated witticism about wanting to come back to earth as the bond market because the bond market bosses everybody around is as dated today as the Clinton presidency. It’s the stock market that a politically ambitious person would choose to become in a second life,” writes Jim Grant, editor of Grant’s Interest Rate Observer and a Barron’s alumnus. Danielle DiMartino Booth blasts Powell for “groveling to whiny investors.” Early in his tenure as a Fed governor, back in 2012, Powell said that the central bank should not protect them from losses. Writing in her Money Strong newsletter, Booth also deemed especially galling “the deference, the flattery, the accolades he showered on Bernanke and Yellen,” given the former Fed chiefs’ previous apparent willingness to alter policy when stocks actually failed to rise all the time. To these illustrious observers of finance and economics, we must demur. The policies of the Fed (along with those of other central banks) were draining global liquidity, spreading asset deflation, and threatening the long-run U.S. economic expansion and shaky economies abroad. The stock market’s capitalization swelled by $9.2 trillion at its peak after Donald Trump’s election victory in November 2016, writes Scott Anderson, chief economist of Bank of the West, a unit of BNP Paribas .But since the market’s September highs, some $4.5 trillion of investor gains have been wiped out in three months. “What starts on Wall Street, rarely stays on Wall Street,” he contends. Consumer confidence, while high by historical standards, has begun to ebb and could fall further as the losses sink in—probably with the receipt of year-end statements. Based on the historic wealth effect of a drop between two and five cents for every dollar lost in wealth, Anderson’s back-of-the-envelope calculations suggest consumers could cut spending by $90 billion to $225 billion. The wealth drag could lower real consumer spending by 0.7-to-1.7 percentage points, to a sluggish growth rate of 0.5%-1.5%, measured from the fourth quarter of 2018 to the fourth quarter of 2019. “In short, the real-world economic impacts from the stock market carnage could be substantial and may fundamentally alter the U.S. economic outlook over the coming year if sustained,” Anderson writes in a research note. The earnings warning from Macy’s(ticker: M), whose shares plunged more than 17% on Thursday, may be more significant when viewed against that backdrop, he adds. Little wonder the Fed adopted a more dovish tone following the stock selloff, he concludes. The most recent precedent for the Fed pausing in its policy tightening would be in 2016. Following its initial lift in rates from near-zero in December 2015, the central bank was expected to raise its federal-funds target range four more times in quarter-point increments in the next year. But those plans changed with the slide in stocks and speculative-grade bonds. Then, in June 2016, came the Brexit vote and the ensuing market upheavals. Only after the U.S. elections, and the ensuing rebound in stocks, did the Fed resume raising rates. But the closest analog to the recent stock swoon appears to be the bear market from October 1956 to October 1957, according to Jeffrey deGraaf, who heads Renaissance Macro Research. That presaged the “Eisenhower recession” of August 1957 to April 1958, when gross domestic product plunged 10.4% and unemployment soared to 7.4% from 4.1%, he writes. That inspired me to take my tattered copy of A Monetary History of the United States: 1867-1960, the monumental work by Milton Friedman and Anna J. Schwartz, from the bookshelf. They wrote that the Fed raised interest rates from 1955 until August 1957, when the recession had already begun and the bear market was well along. By November 1957, the central bank did an about-face and began cutting rates. Moreover, Friedman and Schwartz wrote, the Fed began to buy government securities—what is now called quantitative easing—in March 1958 at the most vigorous pace since during the Great Depression in 1931. The recession bottomed in the next month, attesting to the impact of QE. In contrast, deGraaf finds, the cumulative balance sheets of the world’s major central banks—not just the Fed, but the People’s Bank of China, the Bank of Japan, the European Central Bank, plus some smaller actors—have been shrinking at nearly a 5% annual rate. That is the largest contraction since the “great experiment” in monetary expansion began with the financial crisis. Morgan Stanleyeconomists say the shrinkage in the Fed’s balance sheet played an important role in the volatility of asset markets in late 2018. As a result, they expect the Federal Reserve to end the “normalization” of its asset holdings by next September—earlier than most expect. The reasons extend beyond the stock market swoon, however. Steven Ricchiuto, U.S. chief economist at Mizuho Securities, writes in a client note that the reduction of the Fed’s balance sheet, to just over $4 trillion from a peak of $4.4 trillion in October 2017, has shrunk excess reserves in the banking system far more, by $1 trillion. That has forced foreign banks, the main holders of these excess reserves, to find alternative funding sources and push up money-market rates, which boosts borrowing costs for businesses and consumers. Ricchiuto says this rise supports his contention that the Fed should slow its balance-sheet contraction by March, at the latest. 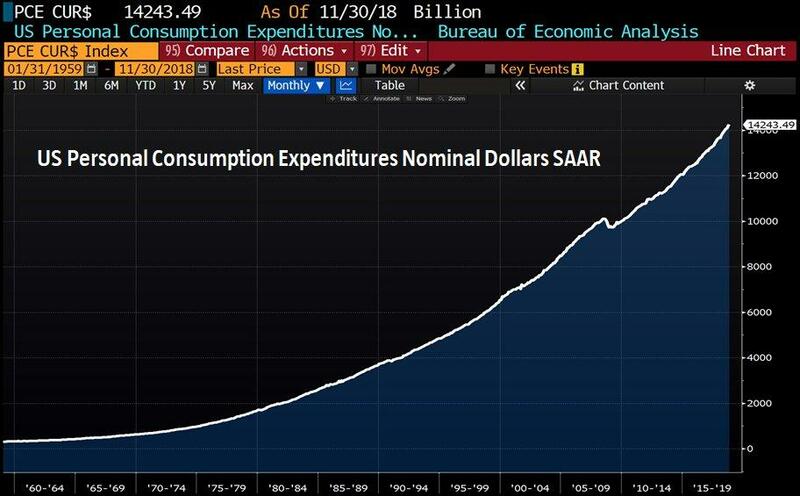 Powell has observed on several occasions that the past three recessions haven’t been caused by inflation, leading the Fed to tighten, but by financial accidents—most recently, the financial crisis of 2008 and the dot-com bubble at the end of the last century. Some may call it a flip-flop, but avoiding another unforced policy error seems like the right decision. The partial shutdown of the Federal government dominates the news, but has so far had minimal market impact, even as 800,000 government workers failed to receive regular paychecks on Friday. Capital Economics estimates the impact of the temporary income loss may be small, but the data-dependent Fed and investors won’t have numbers like December’s retail sales and housing starts as scheduled. 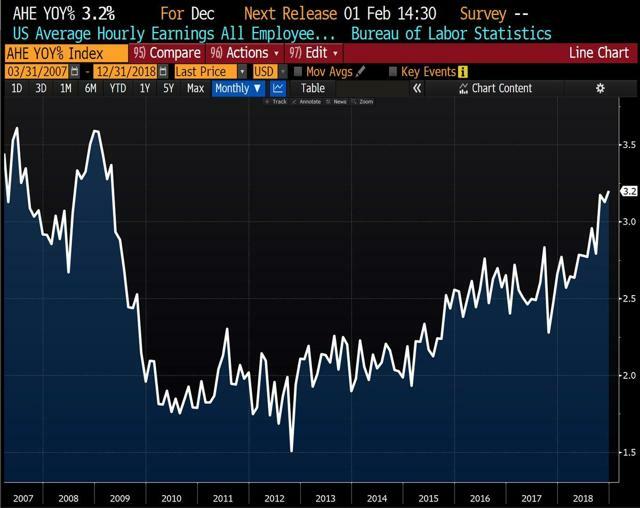 The Labor Department is still open, so the key employment data should be collected, but the shutdown will skew the January numbers. Some 380,000 federal workers are furloughed, which means they will be classified as unemployed in the survey of households, from which the jobless rate is derived, according to JPMorgan economist Daniel Silver. The closely watched payroll data could also reflect a drop of 380,000 government employees and print a negative number. The knock-on effects of federal workers’ cutting spending will likely depend on how long the shutdown drags on. Greg Valliere, chief global strategist at Horizon Investments, thinks a deal may come by the end of this coming week as the suffering extends to air-traffic controllers to FBI employees to farmers failing to receive subsidy payments. Beyond the economic effects, the impasse between President Trump and congressional Democrats offers a dismal preview of divided government. The next test will be passage of a new debt ceiling when the present suspension ends on March 1, Northern Trust economists write. When the debt limit was used as a political football in 2011, the U.S. suffered its first-ever credit downgrade, resulting in a market rout. Which Safe Haven Markets Will Dominate in 2019? If we are, as I believe, on the precipice of a major decline in stocks, the question in my mind as we head into 2019 is to what extent U.S. Treasuries will continue to be the main go-to market in the risk-off trade and to what extent might a loss of confidence in the dollar as the world’s reserve currency lead to a rise in the price of gold? The answer requires an examination of likely flows of money in 2019 and beyond, and those flows are very much determined by the point at which we exist in the current credit cycle. We are in one of the longest credit cycles on record, with 2018 being the tenth year of expansion. GoldMoney’s Alasdair Macleod quite correctly points out that in the late stages of the credit cycle money flows out of the financial sector into the real economy and with the flow out of financial assets, interest rates begin to rise. 10-Year U.S. Treasury yields rose from 1.385% on July 5, 2016, to 3.227% on October 1, 2018. The 10-year rate has corrected to 2.652% as of this writing, but it is clear that with the real economy doing better, interest rates have risen, which in turn has put downward pressure on stocks. With increased volatility in U.S. equities, the recent decline in rates reflects the safe haven risk off attitude. But should we take it as a given, as most mainstream analysts do, that a flow out of stocks automatically means the only safety bunker to hide out in when stocks collapse is the U.S. Treasury market? The answer is an unequivocal “NO!” As Alasdair points out, in the late stages of a credit cycle, Main Street bids the total flows of money away from financial assets. So yes, some money has flowed from stocks to U.S. Treasuries in the latest equity market decline, thus providing the “correction” noted above since October 2018 in the 10-Year Treasury. 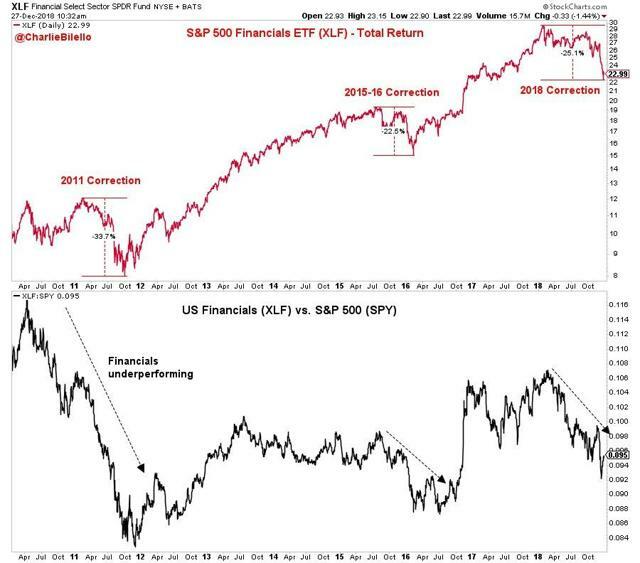 But the point remains that in the late stages of the credit cycle, less money flows into financial assets, thus causing their prices to decline. Once a major crash occurs and a new round of QE is administered, a new cycle usually begins. But can we assume that will happen again, especially with the existing credit cycle bubble, which is now the biggest global bubble yet by far? Given its confidence in the ability of the PhD standard to replace the gold standard, mainstream pundits assume the U.S. Treasury market is better than gold. And the standard answer to my question is a resounding “Yes!” Taylor, can’t you see the performance of geniuses like Greenspan and Bernanke? Well, this 71-year-old author is old enough to remember when the gods of money were not able to hold the system together. During the late 1970s, there was a massive exodus from both stocks and bonds, while at the same time, gold rose from $35 to a momentary $850 price tag. Everyone knows the U.S. debt of $22 trillion will never be repaid, but at present the assumption remains that it can always be rolled over. 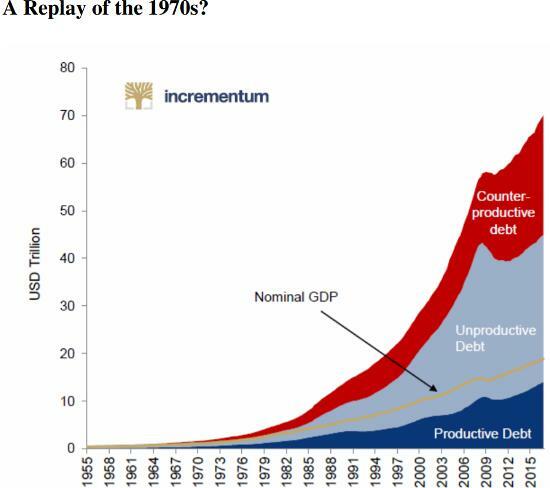 But that assumption was lost in the late 1970s after Nixon removed the gold standard from international trade and the U.S. began printing mountains of dollars out of thin air to pay for socialism and Vietnam. Years of con-artistry since then by Keynesian central banks have left most investors confident that elitist bankers can always save the day. 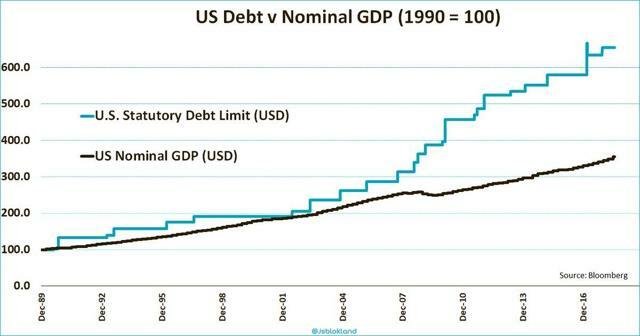 But now take a look at the exponential level of debt since the late 1970s until now and note how much faster debt is growing relative to GDP (yellow line). You don’t have to be a rocket scientist to realize at some point if debt is growing exponentially and income (GDP) on at some low level of linear growth, a day of bankruptcy lies ahead. Yet with each bubble, the U.S. continues to pile more debt upon debt, and the ratio of Debt to GDP continues to grow still further. Over time, more and more debt-based money becomes less productive and eventually counterproductive so that the more debt owed, the less income is generated. We are clearly at the counter-productive level now, not only because of mal investment that occurs with artificially low interest rates, but also because the cost of servicing the debt becomes greater and greater at the expense of productive use of capital. What happens is that income declines to such an extent that the only way debt can be serviced is one of two ways: (1) Either rates must rise to levels that reward savers, resulting in horrendous depression, necessary to set the table for long-term honest growth; or (2) Governments/central banks engage in hyperinflationary money growth that totally destroys the fabric of society and sets the stage for radical changes of government. I believe the U.S. is at such a crucial point of time now. In the 1970s when double digit interest rates were required to dampen rising levels of inflation, the problems faced by then Chairman Volcker were “kids’ stuff” compared to the problems Jay Powell faces now. Even so, Treasury rates north of 12% were required to dampen excess consumption caused by excess government spending and a lack of monetary discipline by the Fed, which was pushed by President Nixon, much as President Trump is pushing Jay Powell now. But the Federal debt then was just a few hundred billion dollars, not $22 trillion as it is now! A mere 1% rise in interest rates now leads to $220 billion of additional government expense, without the government providing any additional services! To add to the problems of Jay Powell, the U.S. continues to spend trillions on wasteful military excursions, and aging baby boomers are now leading to a spiral of debt, taking the U.S. debt levels north of $50 trillion over the next 30 years. But that’s not all. In the past, the U.S. has gotten away with living beyond its means because foreigners like Japan and China have been willing and even eager to buy U.S. Treasuries. That began to change in earnest with the financial crisis of 2008 in no small part because of the financial injury to foreigners by dishonest U.S. bankers. Also, the rest of the world was then realizing that the U.S. Empire was expanding to the point where bankruptcy lay at some point in its not-too-distant future. So now late in the current credit cycle, we are going to face a moment of truth. 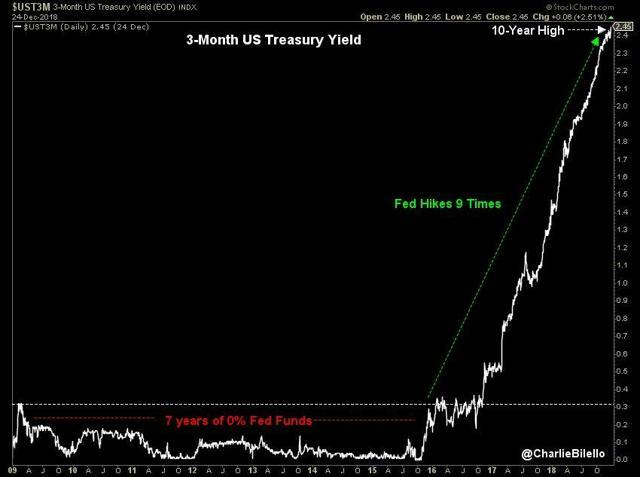 With interest rates far from anything like the double digits of the late 1970s and with a declining appetite to own U.S. Treasuries by foreigners, we are seeing rates rise rather dramatically, leading to massive volatility in stocks and the beginning of a very painful bear market in equities. At some point, history suggests that the Fed will begin to print money in whatever quantity it takes to keep the banks from going bankrupt, just as they did in 2008-09. The big question is, at what point is it obvious that the Emperor is wearing no clothes and there are no longer any takers of U.S. Treasuries, causing the Fed to print so much money so rapidly that foreigners completely abandon the dollar, leaving the Fed with no choice but to hyper-inflate? Given the timing of the current credit cycle, we are nearing a point in time when either the Fed is somehow able to hold the dollar system together for another cycle or the system itself blows up or implodes, leading to a new global monetary regime. In the optimistic scenario gold is likely to behave as it did after 2008, when it rose for the next four years. If my more pessimistic (but very realistic) possible outcome takes place, the dollar will be replaced as the world’s reserve currency and gold will be the only safe haven, leaving it priced at levels in terms of dollars that may be beyond the imagination of even the craziest gold bugs. 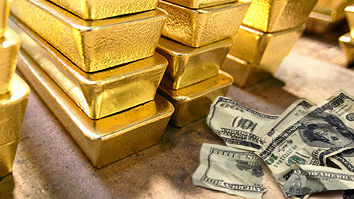 It’s simple math: if the dollar nears a state of worthlessness, gold rises to levels approaching infinity. In the face of a shifting international trade landscape and Brazil’s desire to diversify its trade partners, the future of the Southern Common Market, known by the Spanish acronym Mercosur, is in doubt. Mercosur’s utility has been questioned for years: The bloc imposes trade barriers among its own members and restricts their ability to strike free trade agreements with outside partners. It serves primarily as a governing framework for trade between the region’s two largest economies: Brazil and Argentina. While Venezuela, Paraguay and Uruguay have full membership, their roles are peripheral – and Venezuela is currently suspended from the group. Brazil is undisputedly the dominant force driving Mercosur, but it has grown increasingly dissatisfied with the bloc, which Brasilia believes prevents it from pursuing its foreign relations and trade agenda in full. Blame for Mercosur’s uncertain future has been placed on the bloc’s most recent and most vocal critic, Brazilian President-elect Jair Bolsonaro. But Brazil’s relationship with Mercosur was tenuous long before his election. The bloc has failed to achieve its founding objectives, and Brazil has outgrown its potential benefits. In the coming years, Brazil will have to redefine its relationship with Mercosur. This Deep Dive explores how Brazil’s ties with the bloc have reached a tipping point, and how Mercosur has joined the ranks of trade blocs facing the need to modernize or risk dissolution. Mercosur was the product of timely economic and political forces in the region and around the world: increasing globalization of trade and the collapse of military governments in South America. But its origins can be traced to 1960 and the formation of the Latin American Free Trade Association. LAFTA was the first attempt to replicate European regional economic integration in South America, but the effort failed. Member states were still in a phase of government-supervised industrialization, which included the imposition of trade barriers to discourage imports and coerce consumers into buying domestically produced goods. These countries saw large-scale free trade as a threat to their industrialization, their utmost economic priority. In 1980, the region made a second, more successful attempt at economic integration with the creation of the Latin American Integration Association. ALADI, unlike its predecessor, took a gradual approach to free trade, brokering agreements piecemeal in the short term and aiming for a common market in the long run. Also in the 1980s, a rapprochement was emerging between Brazil and Argentina. Until that point, the two had been rivals in the struggle for regional dominance. They competed for external markets and over nuclear energy development, and in the 1970s, the rivalry devolved into a political crisis over the Itaipu Dam’s construction. But by the 1980s, both were facing economic uncertainty and dealing with political transition, and they couldn’t afford to continue the rivalry any longer. In 1983, Argentina held democratic elections after nine years of military junta rule, and in 1985, voters ousted Brazil’s military dictatorship. These fledgling governments were tasked with enacting political democratization and establishing new institutions against the backdrop of a regional debt crisis and the Cold War. Their vulnerabilities and interests aligned, Buenos Aires and Brasilia overcame their political differences and decided to pursue economic integration. The two saw improved ties as a way to protect domestic industry from global competition and an opportunity to gain influence over each other’s international economic relationships. Despite having five members, it’s clear that Brazil dominates the bloc. Brazil’s population and economy are far larger than any of its neighbors – though Argentina isn’t too far behind. 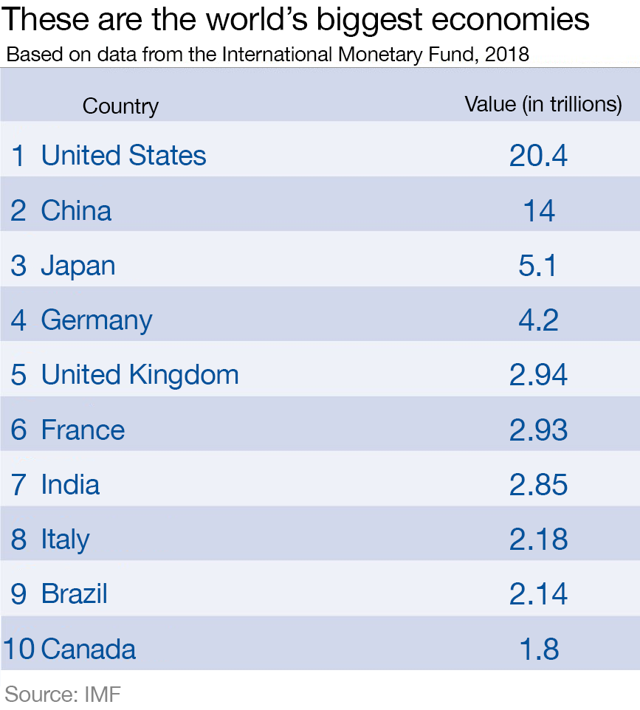 According to the most recent International Monetary Fund figures, the five Mercosur countries’ combined gross domestic product is $2.58 trillion. 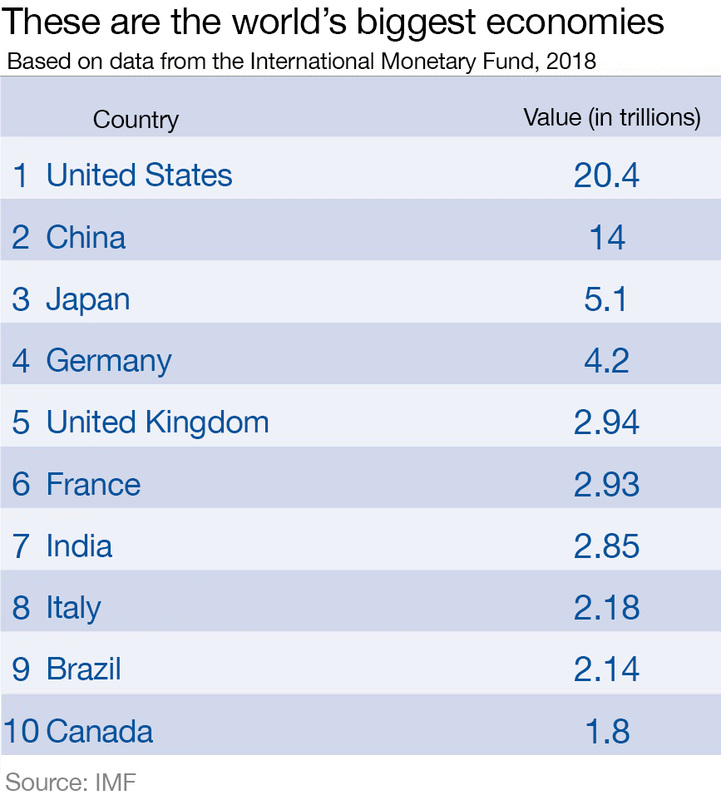 Of that sum, Brazil accounts for $1.91 trillion and Argentina $475 billion. This roughly reflects the proportions of their respective populations: The bloc has 293.4 million inhabitants, 71 percent of whom live in Brazil and 15 percent in Argentina. From the outset, therefore, Brazil has played an outsize role in Mercosur. Including Paraguay and Uruguay in the bloc helped Brazil and Argentina manage their relationships with other countries in the region, while the two smaller economies benefited from having better access to major economies. The new economic bloc set out with four progressive goals for economic cooperation, each building on the last. First, the group would establish a free trade zone with no restrictions on the circulation of goods among member states. Second, it would form a customs union wherein common external tariffs would be uniformly applied across the group. Third, Mercosur would create a common market to allow free movement of labor and capital. And finally, the bloc would synchronize member states’ macroeconomic and trade policies. Nearly three decades later, Mercosur has established relatively free trade practices and components of a customs union, but a complete common market is still a long way off. Over time, Mercosur increasingly restricted trade relationships both within the group and between members and nonmembers. The Protocol of Ouro Preto established the bloc’s basic structure and required unanimity for major decisions – including the addition of new members and signing of free trade agreements with non-ALADI countries. The unanimity requirement made it nearly impossible to get anything done. And without enforcement mechanisms, decisions weren’t always carried out. This has become particularly problematic for Brazil: Despite being the uncontested power of the group, it risks being blocked from pursuing its economic interests by many of its much smaller neighbors. To overcome the gridlock, the bloc has devised ways to circumvent the unanimity requirement on some issues. Members can selectively deviate from the bloc’s tariffs, for example, and set their own rates for specific goods. Much as in the days of ALALC, member states don’t want to jeopardize their economic development – they still need to protect domestic industries and maintain decent employment rates. Within the bloc, they do so at the expense of fully open trade. Each Mercosur country can select goods it believes could be harmed by lifting tariffs and continue charging duties on those products within the bloc. Similarly, each member can select products for exemption from the common external tariff, charging higher rates instead. These workarounds have created two major weaknesses for Mercosur. First, it is not truly a free trade bloc, as hundreds of tariff exemptions have already been granted. New exemptions are constantly being negotiated, which has led to temporary trade blockades as members retaliate against each other’s higher tariffs or lobby for approval of their own hikes. Second, if a member imports cheap goods from a nonmember country, those goods can bleed into the regional market, and this can result in conflict. Paraguay, for example, imports cheap Chinese electronics and basic manufactured goods; Argentina, on the other hand, places higher tariffs on these products to protect domestic industry. But the goods imported by Paraguay could make their way into Argentina, which Buenos Aires sees as a threat. Second, Mercosur’s unanimity requirements make free trade agreements with nonmember states extremely difficult to execute: No single member can sign a bilateral FTA with an external state without the bloc’s consent. In a group with widely different economic needs and interests, consent is often unfeasible. Terms that favor one member might hurt another. But again, Mercosur has found ways to mitigate this problem using the ALADI framework (although only with ALADI member states). Since Mercosur is ALADI’s successor, expanding trade ties with fellow ALADI members shouldn’t interfere with Mercosur’s rules. In fact, Mercosur’s founders originally wanted to use ALADI to facilitate the gradual addition of other regional economies to the new trade bloc. But Mercosur’s restrictions, along with regional political disagreements, mean that further economic integration with other ALADI states may not happen. Adding other ALADI members to Mercosur would require modifying a series of ACEs, expanding them to further open up the market. Some non-Mercosur ALADI members have such arrangements in place with Mercosur. The ACEs, however, are typically developed bilaterally with each member of Mercosur, and not all Mercosur countries are eager to sign such agreements with other ALADI states. For instance, Mexico has significantly expanded its ACE with Uruguay. Yet Mexico’s contentious relationship with Brazil in areas like the automotive industry has prevented the two from significantly expanding certain ACEs. Similarly, Chile and Brazil recently agreed to a broad expansion of several ACEs, but Argentina’s legislature hasn’t approved similar deals with Chile. More broadly, Mercosur members’ hands are tied when it comes to signing bilateral free trade agreements with non-ALADI countries. The bloc’s selectively protectionist measures and controversial ideological stances make it less attractive to external partners, so major trade agreements with global economic powers like the U.S. and China won’t happen any time soon for Mercosur. Thus far, the bloc has only cemented free trade agreements with Egypt and Israel, a general macroeconomic agreement with Morocco and basic preliminary trade agreements with India and the Southern African Customs Union. Another 14 agreements are progressing slowly or have completely stalled. There’s growing hope that Mercosur will sign a free trade agreement with the European Union – but those talks began in 2000, took a hiatus, picked up again in 2010, were paused in 2012, and were again revived, so nobody’s holding their breath. Brazil, in particular, wants to redefine its foreign relations by pivoting away from Latin America toward the Northern Hemisphere. Trade is essential to this strategy, but Mercosur membership is constraining its ambition. Under the bloc’s current structure, Brazil has no chance of signing any significant bilateral trade agreements with partners outside of Latin America. Mercosur’s failure as a trade block is attributable to more than just its structural dysfunction. Over the past decade, its agenda has been dominated not by trade but by politically and ideologically driven projects. The lack of progress on economic integration and the increasing politicization was initially tolerable for Brazil given its economic boom and political climate. But both its economic outlook and its politics have shifted drastically in the past couple of years, making Mercosur’s dysfunction extremely problematic for Brazil. What economic measures Mercosur has managed to advance have had minimal benefit for Brazil. In 2002, the bloc introduced a dispute settlement mechanism, but enforcement of decisions made in the bloc was still weak. In 2017, members signed the Intra-Mercosur Cooperation and Facilitation Investment Protocol, designed to boost investment among Mercosur’s four main economies. This agreement has a clear drawback for Mercosur’s largest economy: While Brazil can now more easily invest in other member states, it’s unlikely that they will reciprocate with the level of investment Brazil needs. Rather, the key sources of investment that Brazil needs are outside the bloc – and this agreement does nothing to help Brazil attract those investors. Similarly, in 2005, Mercosur established its Structural Convergence Fund to finance and develop infrastructure projects that would boost the bloc’s connectivity and competitiveness. The fund’s portfolio includes more than 40 projects worth about $1.4 billion. Because of the economic and development discrepancies within the bloc, Brazil became the primary funder of the projects, though the fund’s resources were mainly allocated to the other member states. In the fund’s early years, Brazil’s economy was thriving, and that dynamic worked. But Brazil’s 2015-2016 recession caused its economy to contract by over 7 percent, and the recession was accompanied by a major corruption scandal that changed how Brazil invests in development and infrastructure. Now Brasilia needs funds to rebuild its economy and can no longer afford to foot the bill for its neighbors’ economic development. Meanwhile, the bloc was becoming increasingly political. Mercosur had flirted with taking a political stance in 1998 with the passage of the Ushuaia Protocol, which stated the bloc’s support for democracy and rejection of illegal changes of government. (The protocol was updated in 2011 to allow but not require Mercosur countries to take concrete measures, like sanctions and border closures, against member states that violate this agreement.) In the 2000s, a wave of populist leaders ascended to power in South America, including in Mercosur member states. Beginning in 2007, the bloc began to establish politically oriented bodies to pursue social and political objectives. This included a social policy research institute, a human rights policy institute and a social participation unit. Mercosur also helped Venezuela cope with its economic crisis through food-for-oil exchanges and leniency on payments for imported godos. The bloc’s increasing politicization created new layers of institutional dysfunction. The strongest manifestation of this was the 2012 suspension of Paraguay – the culmination of several years of political posturing within the group. Paraguay had been blocking Venezuela’s membership in the bloc for years due to its disapproval of the Chavez government – even though the remaining Mercosur members had agreed to let Venezuela into the group. After Paraguayan President Fernando Lugo was impeached in 2012 (a move described by opponents as a parliamentary coup), Mercosur seized on the opportunity to suspend Paraguay’s membership and admit Venezuela as a full member. Paraguay was reinstated in 2013 after elections, and in 2017, Venezuela was also suspended over concerns about democratic institutions. Mercosur used Ushuaia Protocol-related clauses as the basis for both expulsions but did not impose punitive measures. In other words, the suspensions had no serious consequences. While it has put in place controls to promote democracy, Mercosur members can’t agree on how to enforce them – and if they can’t get on the same page, the group risks looking weak. Any punitive measures Mercosur imposes on members could be seen as meddling in domestic affairs. Furthermore, many states are reluctant to impose punitive measures on other members for fear that they, too, could one day face the same fate – they’re not eager to set that precedent. Such political dysfunction, often paired with divergent economic needs and governments’ heavy-handed approach to domestic economic policies, has made Mercosur less appealing as a trade partner and weakened the bloc’s institutional functions. Brazil in 2018 is not the country it was in 1991. In Mercosur’s early years, Brazil found itself in an economic and currency crisis, in a region mired in debt. Mechanisms like Mercosur could help Brazil access global markets and keep Argentina in check. Prior to 2015, Brazil’s economy was booming, its markets attracted foreign investment and its politics aligned fairly well with those of other Mercosur members, so the cost of dealing with Mercosur’s constraints was palatable for Brasilia. But today, it’s crawling out of a steep recession and trying to recover economically. It’s also facing a bleak global outlook, so structural reforms and improved economic ties are time-sensitive. The main benefit Brazil derived from Mercosur – a market for manufactured and semi-manufactured goods – has diminished. It sees more potential in other markets, like the United States. Brazil, then, needs the freedom to access markets that best serve its interest and the leeway to navigate the current trade environment and a slowing global economy. Furthermore, Bolsonaro’s election and its political and foreign policy implications have shunted Brazil further from the bloc. Membership in Mercosur is no longer in Brazil’s interest. In other words, Brazil has reached a breaking point. Its economy is indispensable to Mercosur, and until now, Brazil has not used its economic and geopolitical weight to challenge or threaten the bloc. But the costs and benefits of membership have changed. Brazil’s ability to pursue its own domestic and foreign policy imperatives is more important to Brasilia than the well-being of Mercosur and its members. Brazil can strike deals and attract investment by itself, but to do so would mean turning its back on South American relations. Brazil has three options: maintain the status quo, leave Mercosur or reform the bloc. Clearly, Brazil cannot remain in Mercosur in its current state. Leaving the bloc would burn political bridges and potentially undermine Brazil’s existing trade relationships with ALADI countries – a sizable bloc itself. The most likely scenario is that Brazil will seek to reform Mercosur. This could mean a formal modernization of the Ouro Preto protocol, the signing of an entirely new agreement, shifting trade focus to purely Mercosur partners and loosening it up for non-Mercosur trade or simply striking out on its own with the understanding that the bloc will not inflict punitive measures. Mercosur’s fate will ultimately depend on domestic political forces in the bloc’s member states, but for Brazil, the geopolitical path is clear: It will find a way to extract itself from the current confines of Mercosur.